When Charles Darwin sailed on the Beagle in the early 1830s, he was painfully aware of who had preceded him to South America: Alcide Charles Victor Marie Dessalines d'Orbigny. Darwin wrote to his Cambridge mentor John Henslow about his worries that the Frenchman would find all the best stuff first. Indeed, by getting to the continent first (in 1826), d'Orbigny did see plenty of things before Darwin, including the big flightless bird still known in some circles as Darwin's rhea. D'Orbigny was the one who actually named it. He spent seven years and seven months tramping through Argentina, Brazil, Bolivia, Chile, Peru and Uruguay. He passed an unfortunate 15 days of his long trip in a Brazilian prison after local soldiers found his barometer suspicious. Luckily for the naturalist, he had enough money to buy his freedom. Like Darwin, d'Orbigny chronicled his trip in print, publishing a beautifully illustrated book that discussed the flora, fauna, fossils, geology and human residents of South America. 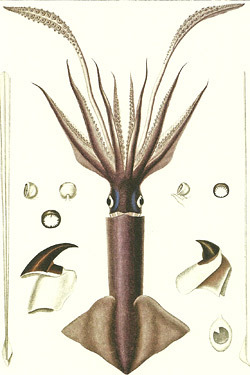 He covered marine organisms, too, including the carnivorous Humboldt squid. The book turned out to be just a small portion of what d'Orbigny published. On the topic of the paleontology of France, starting in 1840, he produced 4,000 written pages and 1,440 lithographic plates. His work encompassed fossil bivalves, cephalopods, gastropods, brachiopods, bryozoans and echinoderms. He described some 2,800 species, all but about 700 of them new to science. He has been criticized for being too quick to name new species, but modern paleontologists still consult his work because it's still useful. The Natural History Museum, London, characterizes his work on bryozoans (miniscule invertebrates that typically live in underwater colonies) as "enormous and long-lasting." For all his appreciation of extinct and extant species, d'Orbigny probably cared the most about foraminifera — single-celled marine organisms with shells. At first, d'Orbigny misunderstood what this tiny life forms were, believing them to be minute mollusks. It was an easy mistake given how much they looked like mollusk shells. A book he wrote on foraminifera was published while he was in South America, including the inaccurate characterization, but by the time he returned from his South American trip, he had recognized his error. D'Orbigny's love of foraminifera started in his boyhood. 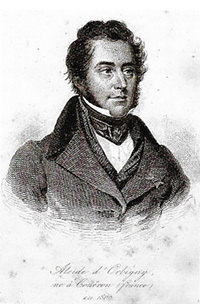 Born in 1802, Alcide d'Orbigny was the second child and first son in a family of seven children, and his father frequently took him looking for mollusk shells, crustaceans, flowers and fossils along France's Atlantic coast. The treasured fossils the father-son team found included foraminifera. As an adult, D'Orbigny wanted to make these animals as accessible and understandable as he could, and he found a couple ways of doing that. One was to publish life-sized plates of the animals. Unfortunately, life-sized for a foram is teensy, so while his illustrations were beautiful, they were still hard to see without a microscope, just like the organisms they depicted. 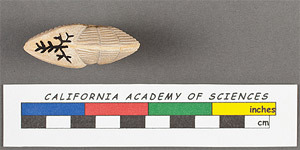 The next approach was to make sized-up models of forams, about 1 inch long. After carving the scaled-up versions out of limestone, he made plaster replicas which were distributed to universities and museums. Many modern institutions still house collections of d'Orbigny's foraminifera models. D'Orbigny was extremely productive throughout his career, but it ended prematurely. He died in his mid-fifties after a protracted illness. His writings continued to be published long after his death, and his work on foraminifera enjoyed a rebirth in the 20th century as the marine organisms proved useful in oil and gas exploration. Darwin himself greatly admired d'Orbigny's book on South America, and often deferred to d'Orbigny's conclusions on the South American fossil record. Darwin also relied on d'Orbigny to identify many of his own marine fossil finds from the Beagle voyage. But unlike Darwin, who developed the theory of natural selection, d'Orbigny was no evolutionist. He was a protégé of the ardent anti-evolutionist Georges Cuvier. Like Cuvier, d'Orbigny believed there had been a series of exterminations followed by creations of new life forms, and he believed these events to have been worldwide. He believed every break in the fossil record to be down to a major catastrophe. Following his own logic, he developed a 27-period geological time scale based on what he assumed were planet-scale mass mortality events. Though he was wrong about the worldwide scope, he was right in concluding that fossils could date rocks, so in addition to his contributions to understanding old and new life forms, he was a pioneer in the field of biostratigraphy.